Fine needle aspiration is an important tool for diagnosis and preoperative evaluation of solitary nodules of the lung. It provides a definitive diagnosis in most patients at low cost with minimal trauma. However, because of the nature of the study and the presentation of the cells in a more distorted and incomplete tissue structure than a histological slide, false positive results can occur. Prior detailed clinical knowledge about the patient, procedures and methods of radiology in obtaining the aspirate specimen is extremely useful in the accurate interpretation of fine needle cytological specimens. We report two cases of solitary pulmonary nodules in two elderly females, which were initially diagnosed as malignant by fine needle aspiration biopsy. Both cases subsequently underwent pulmonary lobectomy in which, one turned out to be a pulmonary hamartoma and the other appeared to be a middle lobe syndrome of the right lung with liver tissue contamination at the time of fine needle aspiration of the lung. We are now strong believers that much care must be taken in the interpretation of fine needle aspiration of solitary nodules of the lung. Complete study of the entire specimen, including the cell block, is warranted, since what one interprets as malignant, could have different features in another part of the sample. Last but not the least, prior knowledge of the complete clinical history of the patient together with the salient radiological findings would greatly facilitate the cytopathologist to reach an accurate diagnosis. Fine needle aspiration is an important tool used in the preoperative evaluation of solitary nodules of the lung. It provides a definitive diagnosis in most patients at low cost with minimal trauma. 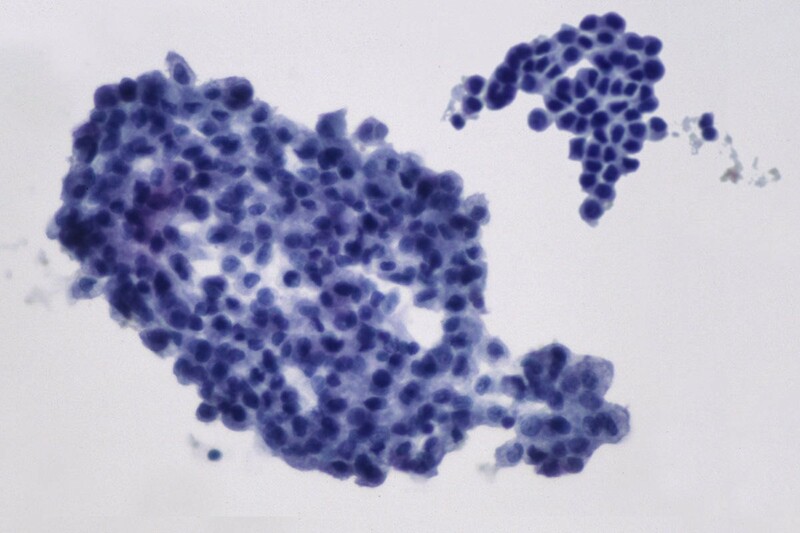 Modern imaging techniques with experienced personnel, often results in a fine needle aspirate of the solitary pulmonary nodule under investigation. False positive errors in this situation are therefore uncommon. However, procedural related contamination, the presentation of the cells in a more distorted and incomplete tissue structure than histological slide and interpretative errors by the cytopathologist, all can lead to false positive results. Prior detailed clinical knowledge about the patient, procedures and methods of radiology in obtaining the aspirate specimen is extremely useful in the accurate interpretation of fine needle cytological specimens. On March 2002, a fine needle aspiration specimen was sent to the pathology unit at Royal University Hospital with the following clinical data: 81 year female, smoker with a solitary nodule in the left lower lobe of the lung (Fig. 1) ? Probable lung cancer. Under CT guidance a fine needle aspiration with a 22 g needle was performed. The specimen was also labeled "Lung aspirate – Left. The cytological slides showed the presence of cohesive group of epithelial cells with altered nuclear-cytoplasmic ratio (Fig. 2) and were diagnosed as positive for malignant cells, favor non small cell adenocarcinoma. CT images at 3 mm thickness, left side up for biopsy. No features suggestive of hamartoma such as calcification, cartilage or the presence of fat were observed. Based on the pathology report, this patient under went surgery. 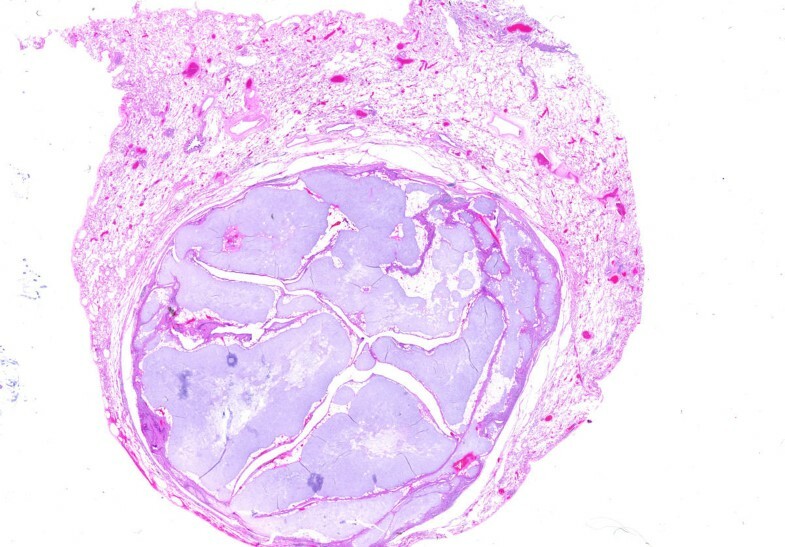 Intraoperative frozen sections from mediastinal and perihilar lymph nodes were negative for malignancy. Left lower lobectomy was performed and the specimen was sent to pathology. There was a firm mass in the periphery of the lower lobe that was quite smooth and exophytic and measured 2.8 cms in maximum dimension. 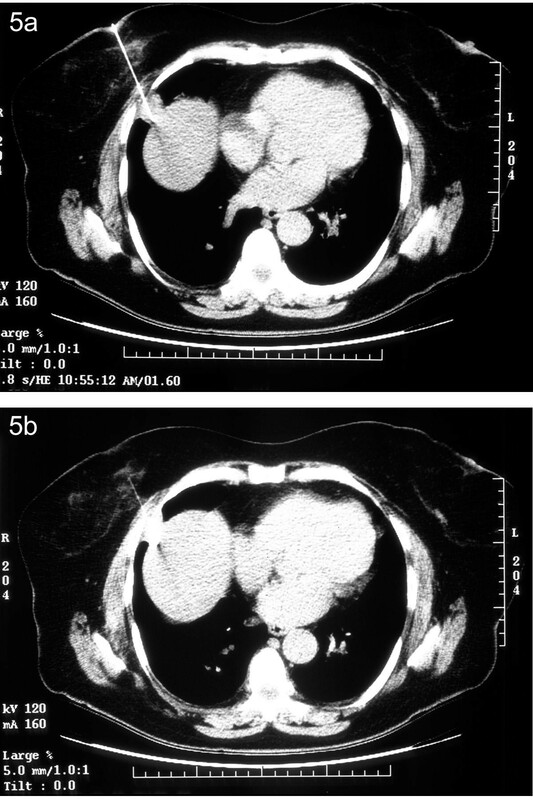 The lesion surprisingly on permanent paraffin blocks turned out to be a pulmonary hamartoma (Fig. 3). 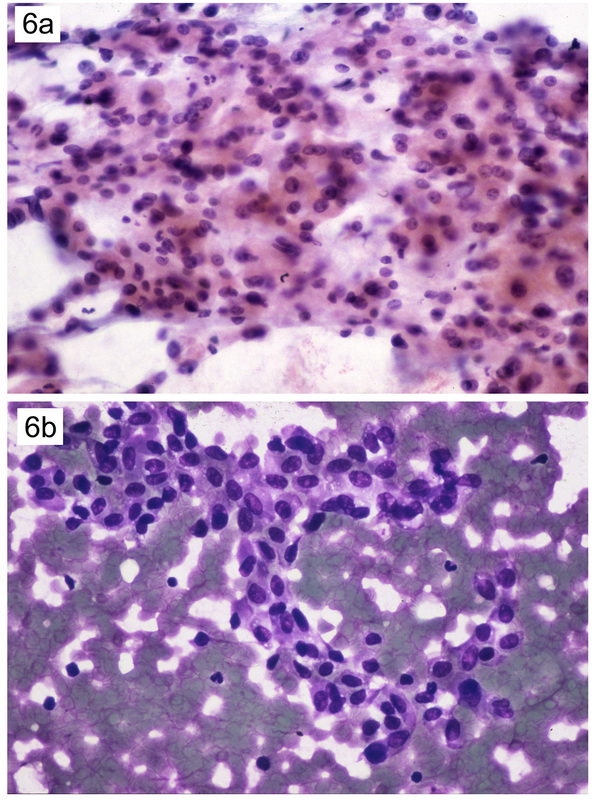 Retrospectively cell blocks ordered on the original cytological specimen did reveal the presence of chondroid material in keeping with a diagnosis of a pulmonary hamartoma (Fig. 4). 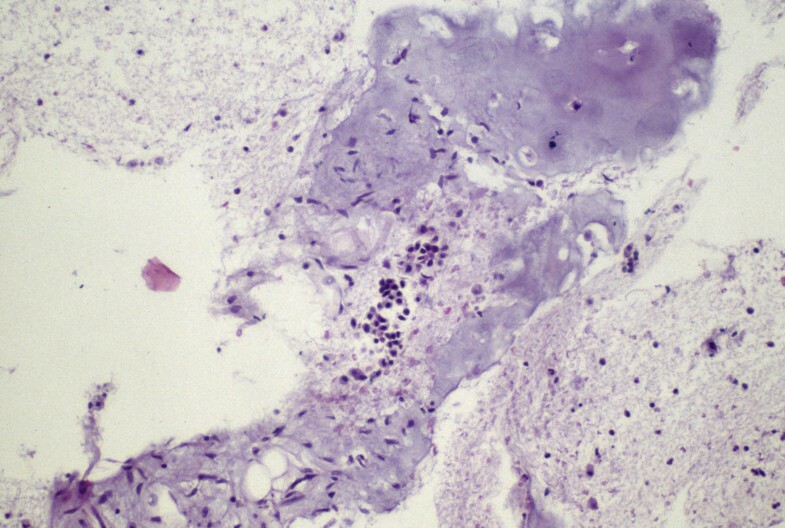 Hematoxylin and eosin stained slide showing the prominent cartilage based lesion in the lung. Cell block preparation demonstrates the presence of chondromyxoid material. On May 2002, a fine needle aspiration, "labeled as right lower lung", was sent to the department of pathology for analysis and diagnosis. The specimen belonged to a 76-year-old Caucasian female who had a demonstrable solitary pulmonary nodule by CT scans. (Fig. 5). Fine needle aspiration was obtained by a 22-gauge needle (Fig. 5). All material and slides including the cellblocks were studied. Atypical cells with abundant cytoplasm and prominent nuclei with coarse chromatin were observed. (Fig. 6a,6b). It was brought to our attention that the specimen should have been from right middle lobe while the pathology report indicated right lower lobe. The issue was discussed with the radiologist and they confirmed that the aspirate was obtained from the middle lobe. Based on the fine needle aspiration report patient underwent right lung middle lobectomy and mediastinal lymphadenectomy. Surprisingly there was no evidence of malignancy anywhere in the resected specimen and the lung showed nonspecific inflammatory changes. 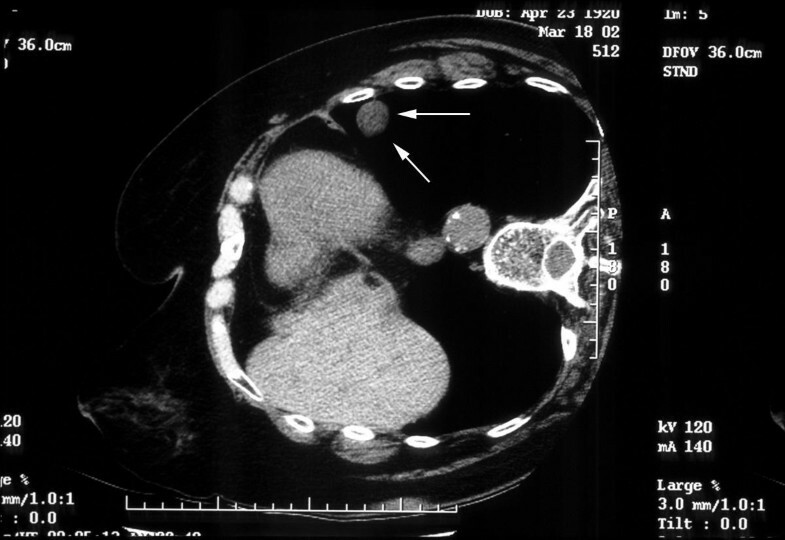 Figure 5a: CT images demonstrate a solitary pulmonary nodule in the right middle lobe of the lung. The 22 g biopsy needle is seen to pass directly through the nodule. Solitary pulmonary nodules are characterized as opacities of the lung surrounded by parenchyma without atelectasis and adenopathy most of which are discovered on routine chest x-rays in an asymptomatic individuals. 50% of solitary lung nodules are malignant. Only less than 5% of all primary lung neoplasms are benign, most of which are hamartomas. So when a clinician suspects a neoplastic lesion it is highly probable to be malignant. Since prompt management of malignant solitary pulmonary nodules presenting at stage 1 (T1, N0, M0) could have 5 year survival rate up to 80%,  early diagnosis is extremely important. Our second diagnosis was compromised by aspiration contamination by hepatocytes and lack of insight of the past medical history. This case eventually turned out to be a middle lobe syndrome. The aspirate contamination by hepatocytes resulting in the presence of "odd" cells in a lung aspirate was confirmed by review of the CT images that shows the tip artifact of the biopsy needle adjacent to the liver parenchyma. (Fig. 5). In the presence of fine needle aspiration biopsy being conducted under image guidance by experienced radiologists such contaminated tissue aspirates remain extremely rare and to our knowledge not reported. 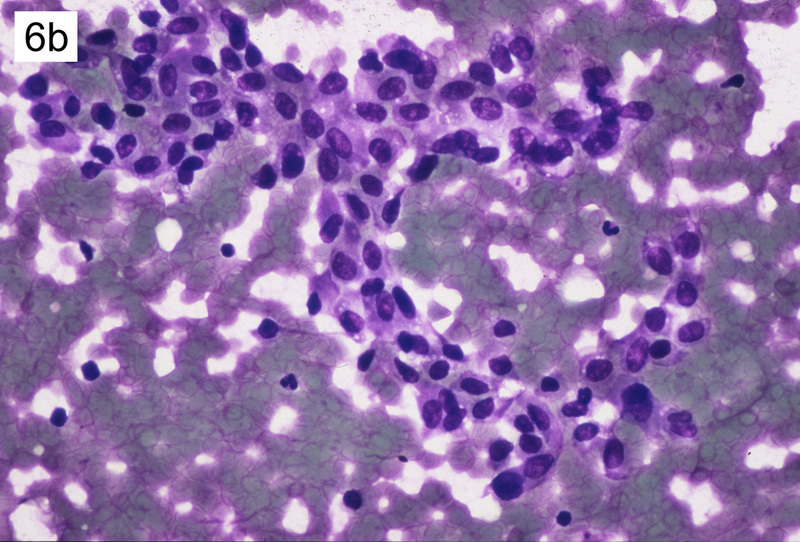 Thus, the lesson we learned in this case is to be aware of the diagnostic pitfalls of liver tissue contaminants in the cytological analysis of right lung aspirates leading to a false positive diagnosis of malignancy in benign lesions. Clinical history together with radiological and laboratory results markedly reduces the number of all possible diagnoses into a small subset of probable ones. Clinical information can be the single most important factor in the reliability of a test. On retrospective review we found that the patient with pulmonary hamartoma, happened to have a pulmonary nodule 4 years back in a routine chest roentgenogram. Apparently no further investigations were done at that time. The nodule had recently doubled in size and remained suspicious for malignancy. Patient also was essentially asymptomatic and the only risk factor was her smoking habit for 40 years. Such information if available at the time could have averted the cytopathologists final report of the aspiration cytology as malignant. In retrospective review of our second case with liver aspirate contamination, we found the patient to be completely asymptomatic with no history of smoking at all. The patient only had shown an irregular pleural-based right middle lobe lesion that seemed to be parenchymal, in her routine chest x-ray. In this case the finding of the odd looking nuclei of liver origin in a supposed lung aspirate was a complete surprise. Artifacts, inadequate specimen or inaccurate localization of aspiration are the factors that need to be kept in mind as diagnostic pitfalls in the interpretation of fine needle aspiration biopsies of solitary pulmonary nodules. In this context, we were not able to find many related articles in our search on all the medical literature listed in Pubmed. It could be partly because of rarity of such an error or failure of reporting these errors. We strongly believe that reporting these types of errors will raise the awareness of both the clinician and pathologist in the interpretation of fine needle aspiration biopsies. Tissue contamination can occur with CT-scan guided aspiration techniques leading to interpretative errors for the unwary cytopathologist. Complete study of the entire specimen, including the cell blocks is also recommended since different cell components may be represented in different cell preparations. Last but not the least, detailed clinical history of the patient is an invaluable tool to assist in the accurate diagnosis of fine needle aspiration biopsies. "Written consent was obtained from the patients for publication of study". We would also like to thank Todd Reichert and Michelle Hesson for all their help in the production of the illustrations for this manuscript. RK is the surgical pathologist who diagnosed and followed up these cases and BT participated actively in the production of this manuscript. BB is the radiologist in charge of the image-guided aspirations. All authors participated in the manuscript with review by BB.